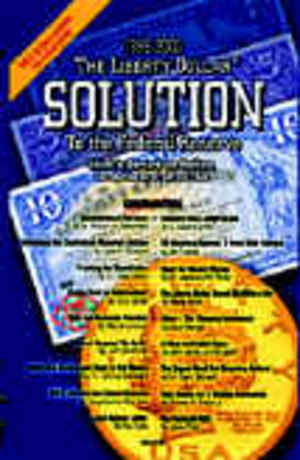 Liberty Dollar SOLUTION to the Federal Reserve was written to commemorate five successful years of the Liberty Dollar and to detail the economic, political, and moral foundations on which the Liberty Dollar currency is based. In addition to Bernard von NotHaus, founder and monetary architect of the Liberty Dollar, eighteen contributors added material to the book, including 6 PhD economists, 2 lawyers, a U.S. Congressman, and a physician. Bernard von NotHaus recently retired after 25 years as the Mintmaster at the Royal Hawaiian Mint where he specialized in Hawaiian numismatics and created financial instruments for local, national, and international clients. His Hawaiian work is cataloged in many articles and books, including Hawaiian Money by David Medcalf, Unusual World Coins by Colin Bruce II, and the Platinum Buyers Handbook. Dating from 1974, when von NotHaus wrote "To Know Value - Economic Research Paper", he has studied economics and monetary history. Von NotHaus is well known in the numismatic community as an original thinker who relishes the type of complex problems he encountered while designing and developing the Liberty Dollar. Since 1998, he has been the Monetary Architect at NORFED, a non-profit, free enterprise corporation that distributes the Liberty Dollar.